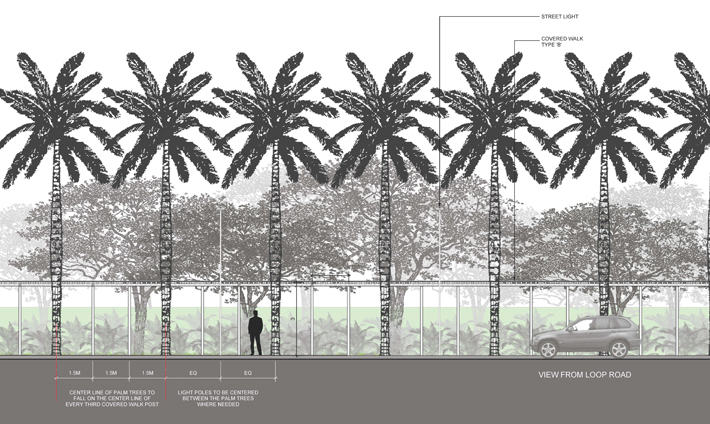 PWP is designing the campus landscape for the New Era University in Manila Philippines. The first phase development includes the Philippine Arena designed by Populous, which will be the largest indoor arena in the world with a seating capacity over 50,000; The Philippine Sports Stadium; The Sports Center, an indoor aquatic and tennis center; a hotel; and a 600 bed hospital. 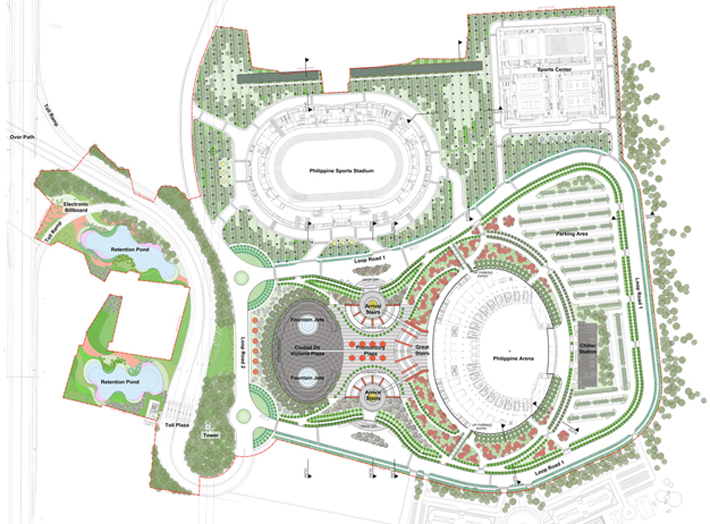 The landscape design for phase one includes: The Philippine Arena, the Stadium Gardens, and the Water Gardens. 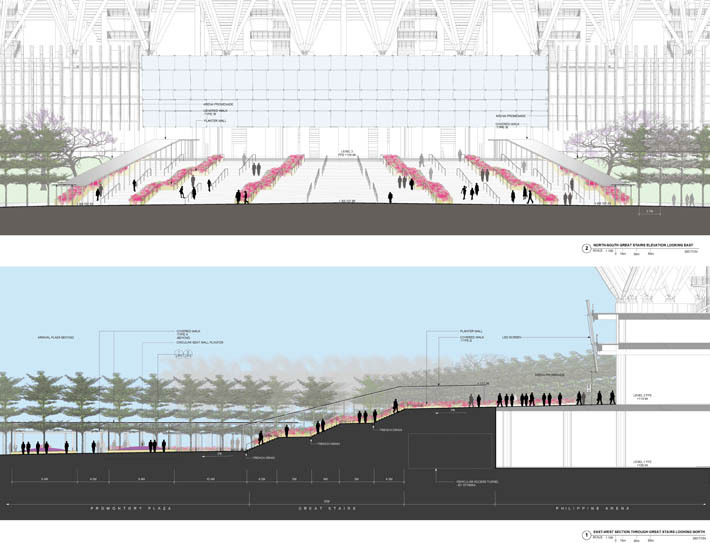 The Philippine Arena landscape design is defined by a curvilinear system of formal trees and covered walkways that echo the elliptical form of the Arena connecting two arrival areas, two plazas and a grand stair that leads to the arena. The Stadium Gardens are defined by vertical layers of palm trees, drifts of informal flowering gardens, and dense hedges that expose two clearings for accommodating large casual gatherings or organized events. Currently under construction, the project opening is scheduled for July 2014. A series of outdoor plazas, gardens and performance venues form the setting for the development including: The North and South Arrival Plazas, The Promontory Plaza, The Great Stairs, and Ciudad de Victoria Plaza that are all related to each other with two cross axes (N-S and E-W) that intersect at the Promontory Plaza. These spaces are woven together both by a spine of formal trees and covered walkways that echo the elliptical form of the Arena. Visitors arrive to the Arena by bus or by car at the vehicular drop-offs that lead to one of two Arrival Plazas. Covered walks lead to the Promontory Plaza that greets visitors with colorful flowering trees, stepped circular planters, planter walls, and garden displays. The space is intended for meeting, socializing, resting, and moving through to other destinations in the complex. From here, visitors have easy access to the Arena, Great Stairs, or Ciudad De Victoria Plaza through arced stairs, which also create a natural amphitheater for smaller events. The Great Stairs will provide a graceful transition to the main entrance of the Philippine Arena, as well as casual seating for cooler days and evenings. Bougainvillea cascades down the steps providing a sculptural element to the experience. The Ciudad De Victoria Plaza can easily accommodate massive performances, sporting events, and celebrations. PWP has designed the space to be as flexible as possible so that it may be successfully programed to draw in repeated crowds and meet a variety of programmatic needs. In response to the need to provide human scale to such a massive space, PWP introduced a bold and graphic paving pattern, two 15M tall fountain jets that frame views to the Arena, and a richly layered plaza edge. The fountains may be turned off and fully drained so that the entire surface may be used during large events. The Covered Walkways provide a necessary relief and protection from incliment weather and intense sun and heat during the remainder of the year. The sweeping curves of the Covered Walks mirror the Arena geometry and serve to unify the landscape. Informal plantings of brilliant flowering trees and display gardens will create festive gradient of color that intensifies toward the Arena: Gold and white upon arrival, brilliant fuchsia at Promontory, and sweeping, vibrant reds at the Arena slopes and main entrance. The Stadium Gardens are conceived as a vertical layered landscape of formal and informal planting that provide visitors with a variety of experiences when viewed from inside or afar. 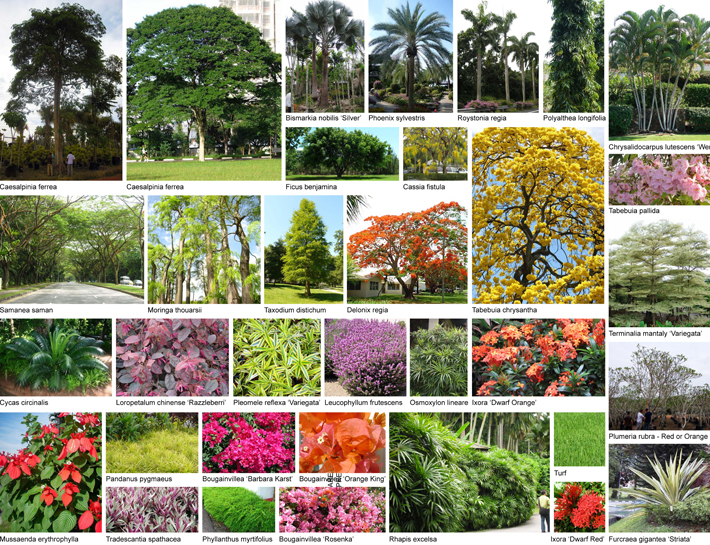 When approaching the gardens by vehicle, a grid of Palms is perceived as a singular canopy above the informal flowering gardens below. On the ground plane, a regular system of east-west cobble stone paths, planting beds, and lawn openings define pedestrian circulation and spatial organization. Two large clearings allow for gatherings during celebrations and sporting events. A dense hedgerow creates the backdrop to the gardens and pedestrian promenade.